With questions looming about Islamist influence in a transitional Egypt, an organization that calls itself "the leading Islamic Institute in the West" is teaching students to support Sharia law in Egypt and around the world. "When I look at what is happening in the world and you see that people are scared of Islam and Islamists, it makes me ask the question; was Mubarak ruling Egypt with Islam? They were ruling Egypt with secularism that came from the West," said Vice President and Professor Waleed Basyouni in a recent interview. "Isn't it the right of people that they live with Islam, their religion and allow it to guide them? The failure of these systems is an excellent example that these secular systems don't work. It created corrupt dictatorships in these regions." Yasir Qadhi, the institute's dean of academics, said that the tradition from Islam's prophet could be seen in the events of Egypt and the coming reckoning for inhuman, non-Muslim states. "For indeed, Allah might give a tyrant some respite, but He never neglects such a person, and when Allah's reckoning comes, it is swift and just. Tyranny is darkness, as our Prophet salla (Allahu alayhi wa sallam) said, and injustice will never be allowed to go unchecked," Qadhi said in a statement published last week at MuslimMatters.org. "And if this is happening here, in a Muslim land, how about injustices being perpetrated by others who do not believe in a God nor do they have any humanity left in them? What will entire states who practice injustice against innocent civilians and occupy their lands do when the Lord of those peasants and the Protector of the weak calls the tyrants and occupiers to task? Let them pay heed if they have any heart to do so, for their time shall surely come as well." Qadhi, who denounced Holocaust denial after his own anti-Semitic statements were exposed, has previously taught about the tyranny of secular law. Qadhi is the same AlMaghrib Insitute professor who was cited by CNN for his starring role in the 2008 U.S.-funded Counter-Radicalization Strategy conference by the National Counterterrorism Center. As part of a TV series named the "Fundamentals of Faith," which was broadcast on the popular British Muslim TV 'Islam Channel,' Qadhi showed his contempt for all other systems of thought besides Islam. "This type of thinking is clear kufr, clear disbelief, to believe that you know better, or any system of government knows better, any democracy, or any… whether it be communism or socialism, any type of philosophy is better than Islam, or it is allowed legitimately, it is allowed to follow this system, this is a profession of the fact that you believe that Allah is not All-Knowledgeable," Qadhi told TV viewers. "To believe that it is permissible to follow a way of life, to follow a system of laws other than the Shariah, negates one's testimony of Islam." "No supreme court, no system of government, no democracy where they vote. Can you believe it, a group of people coming together and voting, and the majority vote will then be the law of the land? What gives you the right to prohibit something or allow something?" Qadhi said. Qadhi has been the spotlight before, trying to refute accusations of AlMaghib influence on would-be bomber Umar Farouk Abdulmutallab, who attended several courses put on by the group before trying to blow up a commercial airplane on Christmas Day 2009. CNN interviewed Qadhi without mentioning his stand on political Islam, saying he "has been involved in de-radicalization efforts in the United States." In addition to support for political Islam expressed by the institute's Qadhi and Basyouni , the organization's leader has expressed support for violence and hatred of other religions. 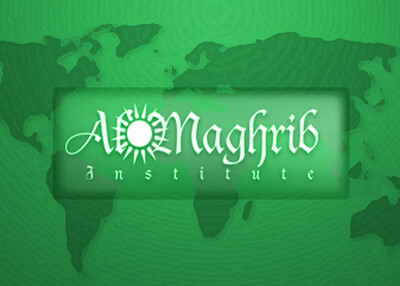 Muhammad AlShareef, the director and founder of AlMaghrib Institute, has given speeches like "Why the Jews are Cursed" and "The World's Bravest People." The latter speech praised the fighters in Chechnya and encouraged listeners to learn about their fight at qoqaz.net, a news, recruitment, and fundraising site for the Chechen jihad. "When you see a brother and a sister dying in Chechnya it's you who is dying there. It's you who is dying on television. If you see a mother and a father, that's your parents that are being killed on television. It's your family," AlShareef said. He also told the audience that it was a duty to help the Muslims in need and that "jihad in the path of Allah" is the "best action." "Allah says if they seek your aid in the name of Islam, in the name of the deen [religion], it is your duty to help them," he said. "And what's wrong with you that you do not fight in the sake of Allah swt?" "It is a very, very expensive price that a person pays in order to get a more expensive reward and that is Jennah Al-Firdaus [The Highest Heaven]. And so Allah, he does not give that position to anybody who just dreams of it, but a person must act and must work for those places."